Received my bag where does the foam bit go? The foam pad goes in the base of the main bag to keep your scales happy. Place the foam insert in with the single hole at the front. Alrighty got my base in what next...? 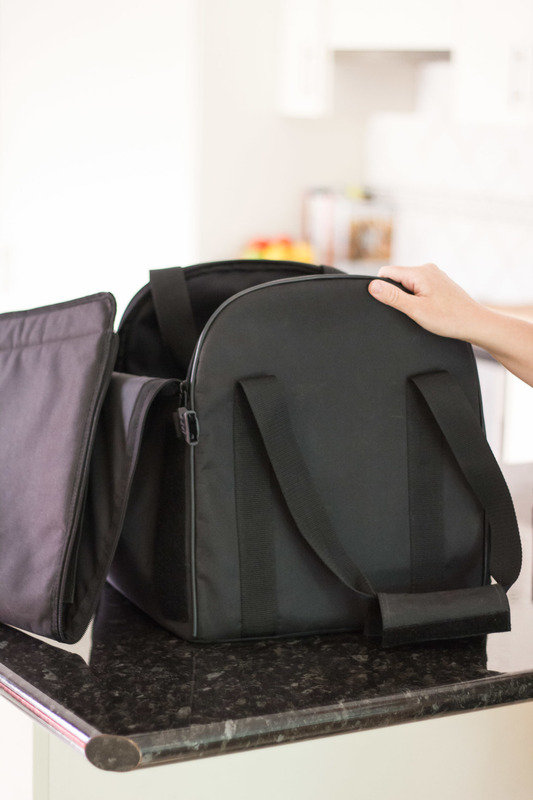 How do I pack my Thermomix into the bag? As per your manual (page 21) you need put your bowl into the base and set your machine into "Transportation Mode" (found under the Menu on the touch screen). Back up a step... If you are packing your steaming basket pop that in now and I find it best to turn your lid sidewards so its not sticking out the front directly. At this stage I remove my chip and place it into the chip pocket located on the flap of the main bag. Recheck your Thermie is in transportation mode, shut down, coil the power cord and you are good to go. If packing a TM31 just ignore the transportation mode bit and follow the rest. Picking her (or him) up gently place her in front of the bag first, lining up the front hole and then put down at the back. Load up your accessories spatula (or spatulas), butterfly, book, varoma, thermoserver... whatever takes your fancy. Zip, velcro and buckle up (see below) if you want to carry as 1 piece or keep them separate and carry in individually. The TM5 must be kept upright at all times. 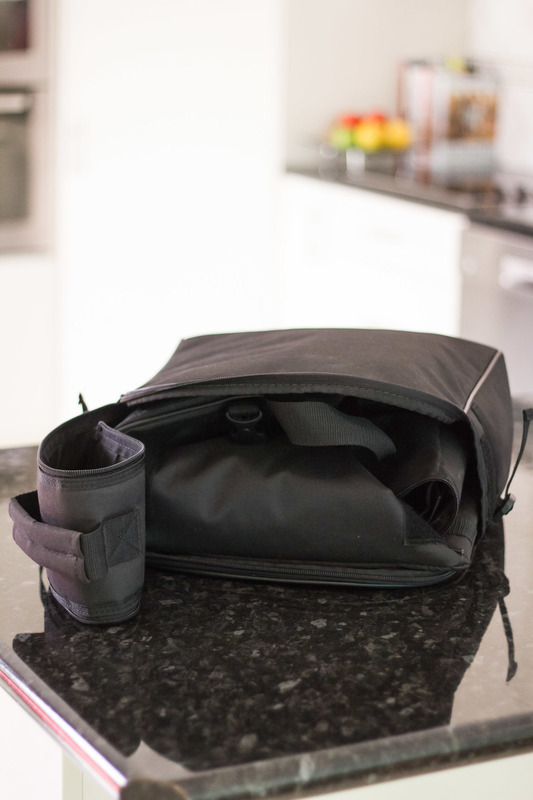 If you are taking the varoma bag as well you can fit the varoma as well as a thermoserver all in the bag. The thermoserver should fit nicely between the varoma and the lids. Or you can leave them home and pack it with supplies (herbs etc). To attach the bags together simply line up the velcro and do up the buckle on each side. When the bags are connected always use the main bag handle when lifting. And don't forget you are picking up 8kg of thermie (TM5) + 2kg of bag + whatever you have packed into the varoma bag so lift safely! So I read that I can fold the bag back up and store inside the varoma bag... how? Slide everything into your varoma bag. Its simple once you know how. Bulky bag storage issues solved! Yes, and no. It depends. If you have a TM31, you can pop it into the special travel bag, but first you need to remove the blades and put them in your suitcase. Also, take the Varoma out of the back pocket and put that in your suitcase too, or it will be too bulky. (I just pack clothes in and around it in the suitcase.) The carry bag can then fit in the overhead compartment, laying on its’ back. It will weigh nearly 7kg, so it’s just that and a handbag/computer bag for carry on if you do it this way. If you have a TM5, you’ll need to pack it in its’ original box and foam packaging (I hope you saved it! ), mark the box as FRAGILE (and make it clear which way up it should be), then put it through with the suitcases. Don’t forget to add an extra bag to your luggage allowance. It will weigh about 10kg. You should also check with your airline to double check as some are very strict on sizes of hand luggage. Can I pick up a bag rather than have it delivered? Sure pickup is available from Viewbank (3084) by request. Select pick up option on checkout. Can I get the bag from other locations? At this stage you can only purchase your Whole Home bag via our online shop. Postage varies on location ranging from $10 to $25. Express option available in checkout. What are the bag dimensions? And how much does the bag/s weigh? The base of the bag is 36cm x 36cm and a height of 39cm for the machine section of the bags. The main bag weighs 1.5kg & the "Varoma" bag weighs 535 grams according to my Thermie scales. So just over 2kg before you load it. Whole Home has no association with Vorwerk or its distributors in any country including Thermomix in Australia Pty Ltd. The Thermomix travel set has not been tested by Vorwerk, or any of its distributors and Vorwerk and its distributors have not authorised or approved the use of the Whole Home travel set with the Thermomix machine.